Like the Windows phone's Metro style user interface? If you do, you're definitely excited to see Microsoft has put Metro on Windows 8 as the Start Screen interface. 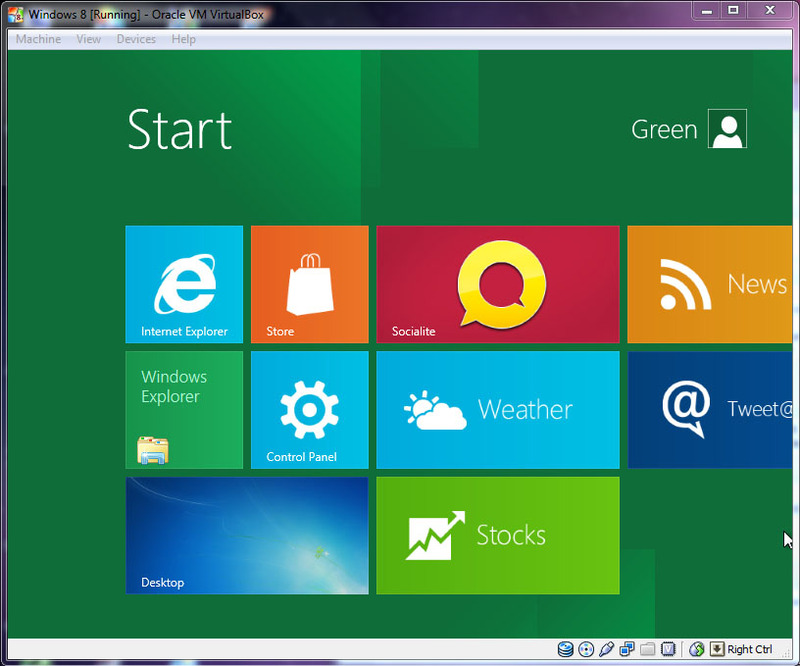 Microsoft released Windows 8 Developer Preview to the public so that developers can build more Windows 8 Metro style apps. So we can have a first look of how the Windows 8 works like. 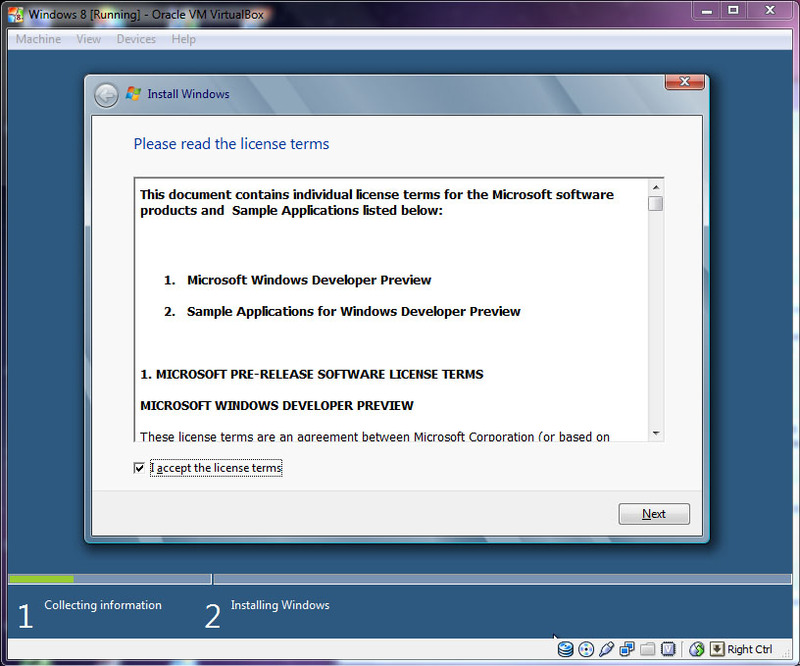 Windows 8 Developer Preview is a pre-beta and not feature complete operating system. It is better to try it on VirtualBox instead of using as your machine's OS. 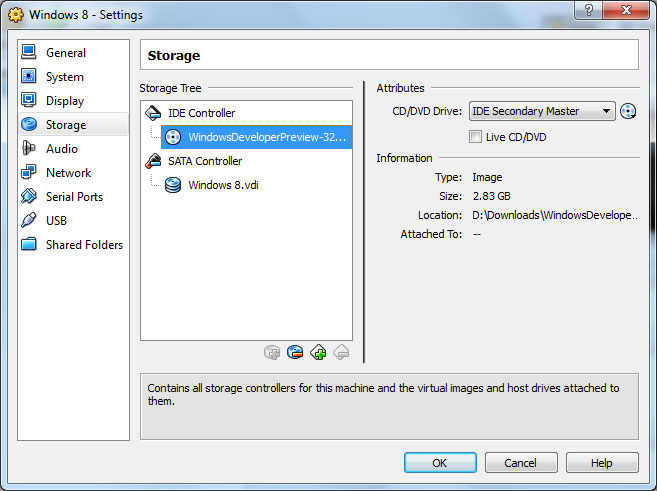 Download Windows 8 Developer Preview ISO file from here and the VirtualBox. 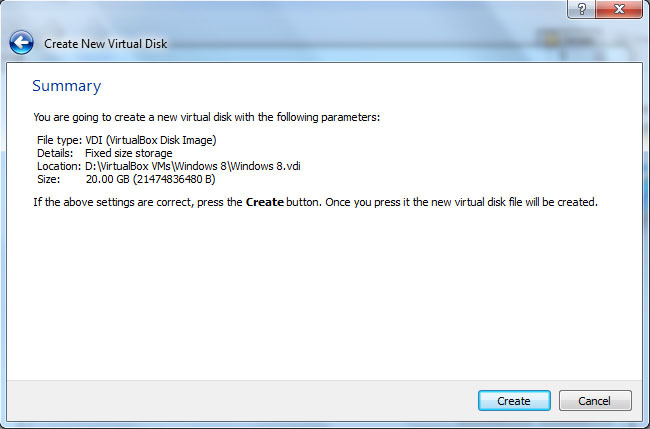 Open VirtualBox and click New to create new virtual machine. 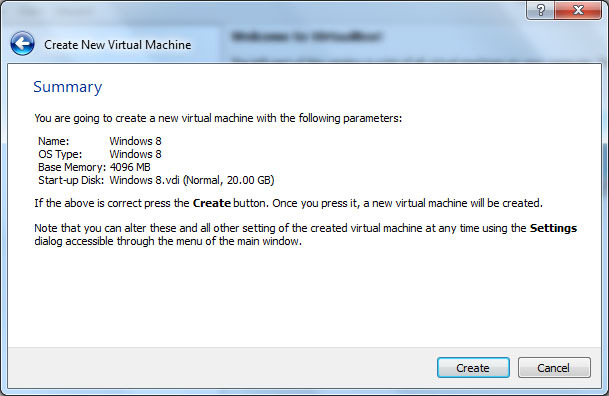 Enter a name for your new virtual machine, select Microsoft Windows as Operating System and Windows 8 as Version. 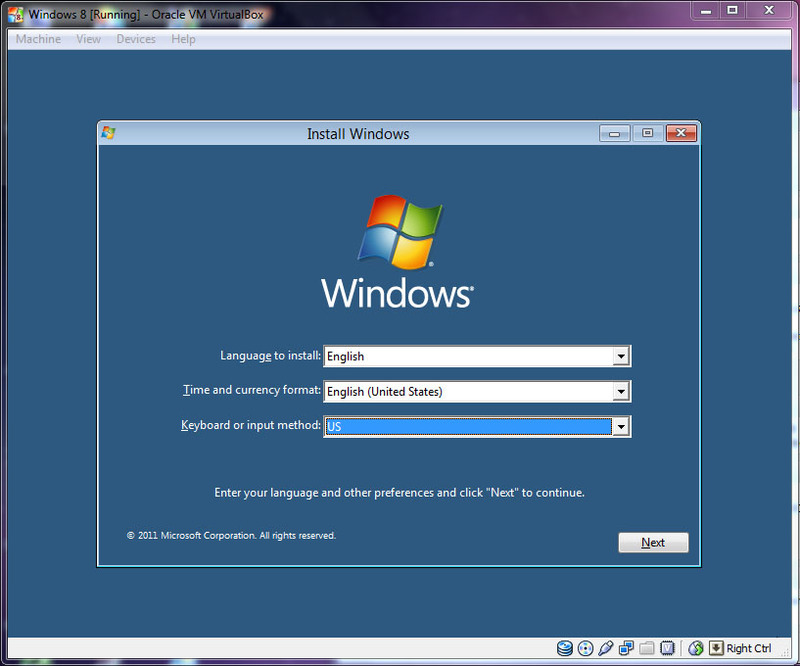 Note that Microsoft provides Windows 8 32-bit (x86) and 64-bit (x64) for download. 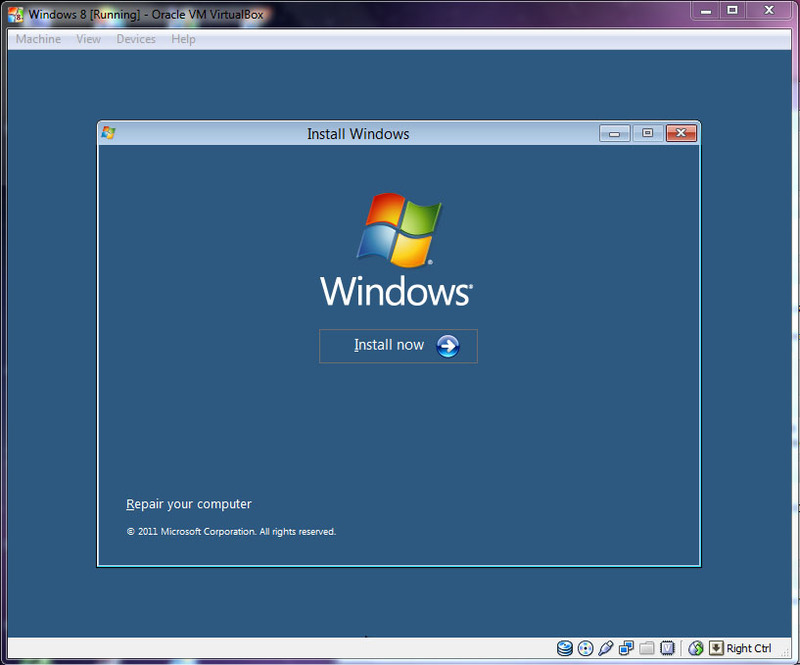 If you downloaded Windows 8 64-bit (x64), then choose Windows 8 (64 bit) as your Version on VirtualBox. In my case, I downloaded the 32-bit so I name it Windows 8, Microsoft Windows as Operating System, and Windows 8 as Version. When you done, click Next. 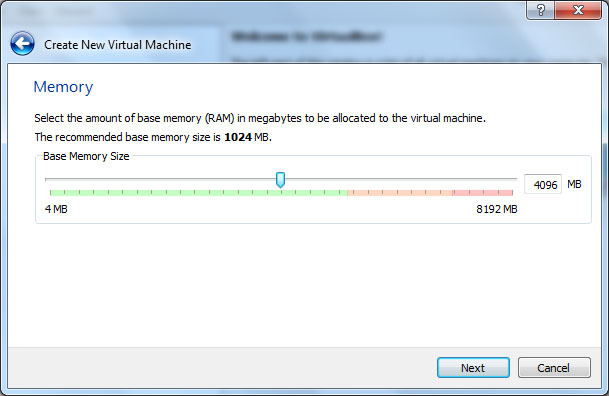 Assign amount of base memory (RAM) for Windows virtual machine. At least 1GB RAM for Windows 8 32-bit, 2GB RAM for Windows 8 64-bit. I allocate 4096MB which is equivalent to 4GB to my Windows virtual machine for better performance. Click Next. 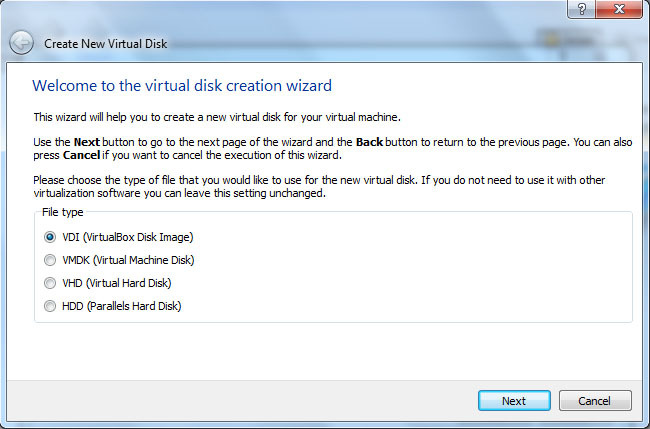 The Virtual Hard Disk page appears, choose Create new hard disk and click Next. 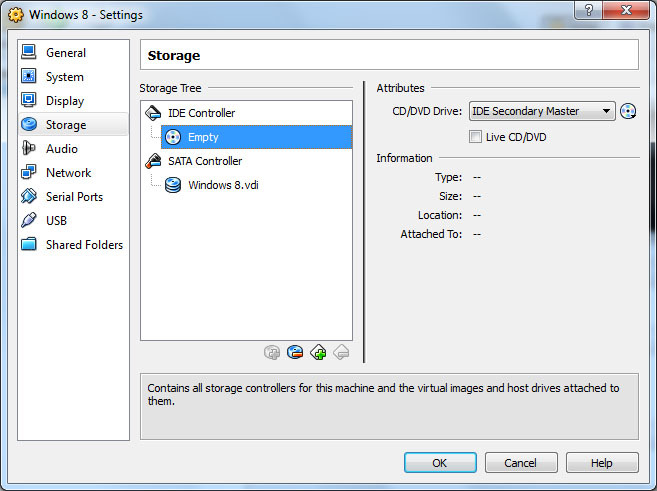 Choose VDI (VirtualBox Disk Image) as File type and proceed to the next page. I recommend you use Dynamically allocated as Storage details if you just want to play around with Windows 8 for short term. For long term, use Fixed size as Storage details will take longer time to create but faster to use. Click Next. 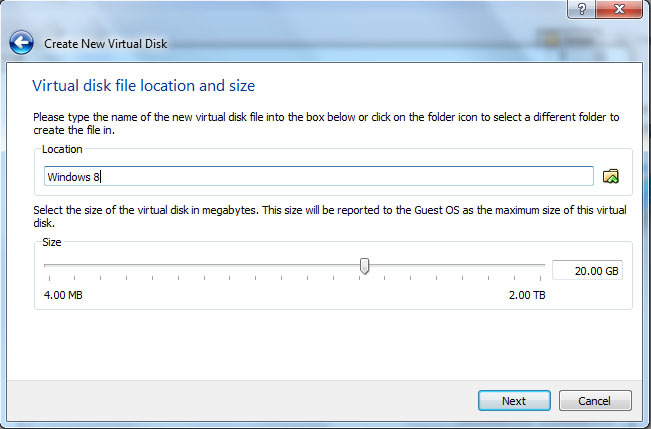 Assign the size of Windows virtual machine. At least 16GB free space for Windows 8 32-bit, 20GB free space for Windows 8 64-bit. When done, click Next. The Summary page appears, confirm the parameters and click Create. 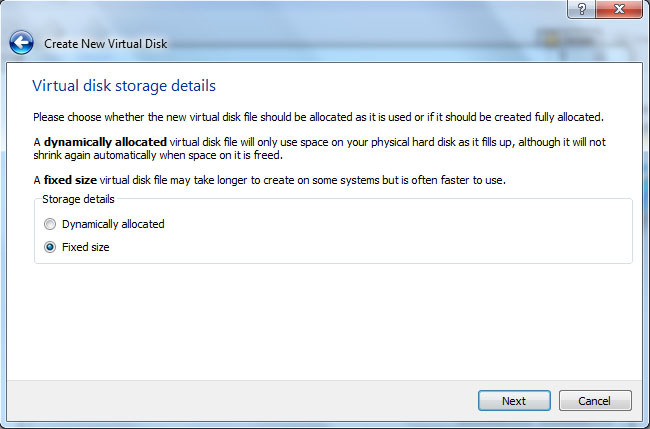 VirtualBox will take a few minutes to create fixed medium storage. Confirm the parameters and click Create. 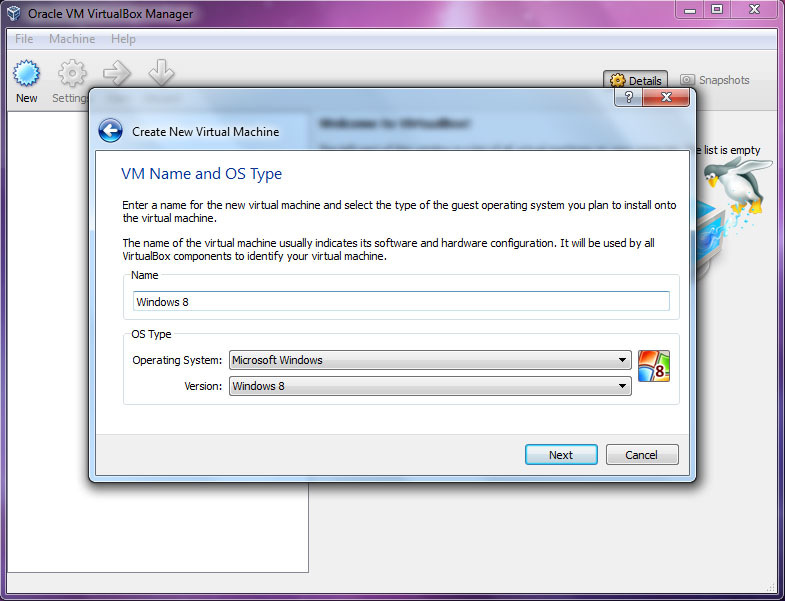 You have create a virtual machine. Don't start it yet. 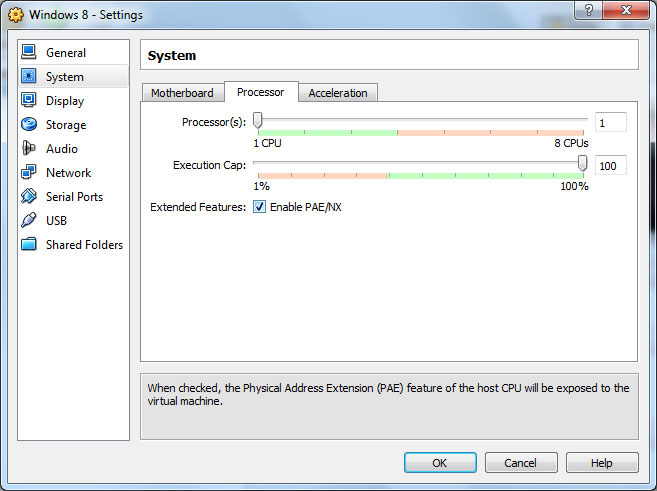 Now go to Settings, click System, click Processor tab and Enable PAE/NX. 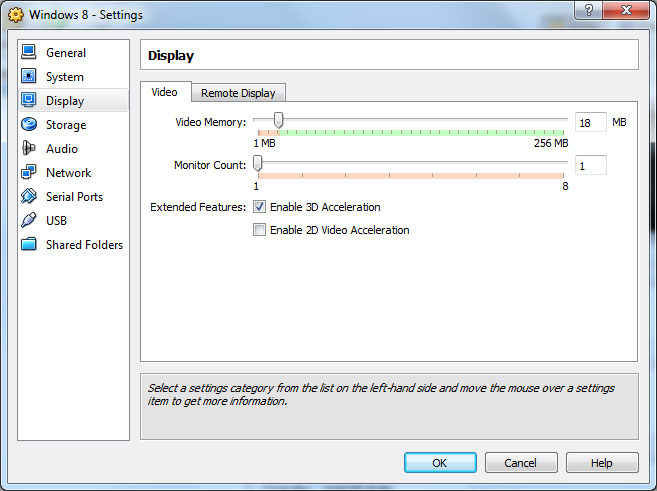 Click Display and Enable 3D Acceleration. Still on Settings page, click Storage. Highlight Empty which is under IDE Controller. Under Attributes, click the CD icon and Choose a virtual CD/DVD disk file. 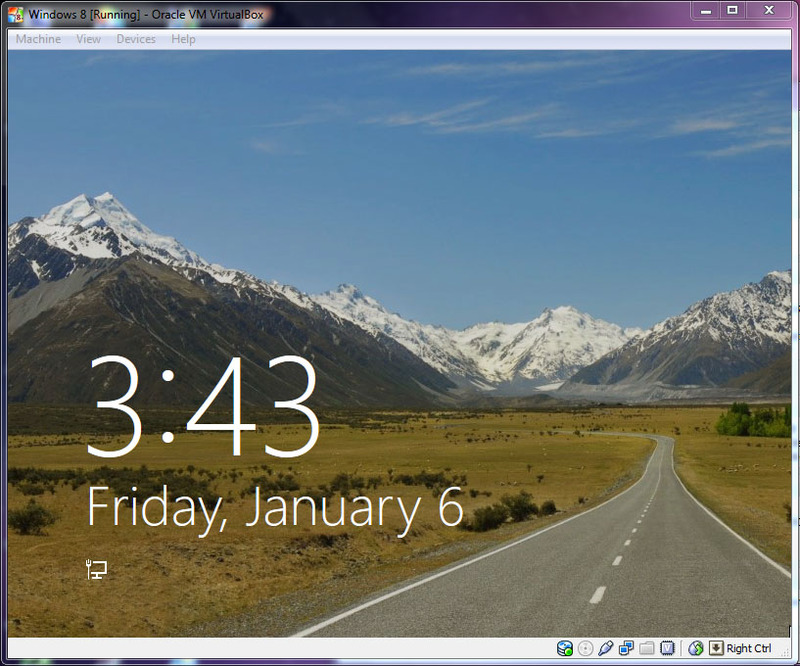 Browser the Windows 8 ISO file and click Open. Click OK to apply the changes on settings. The parameters should be like the picture below. 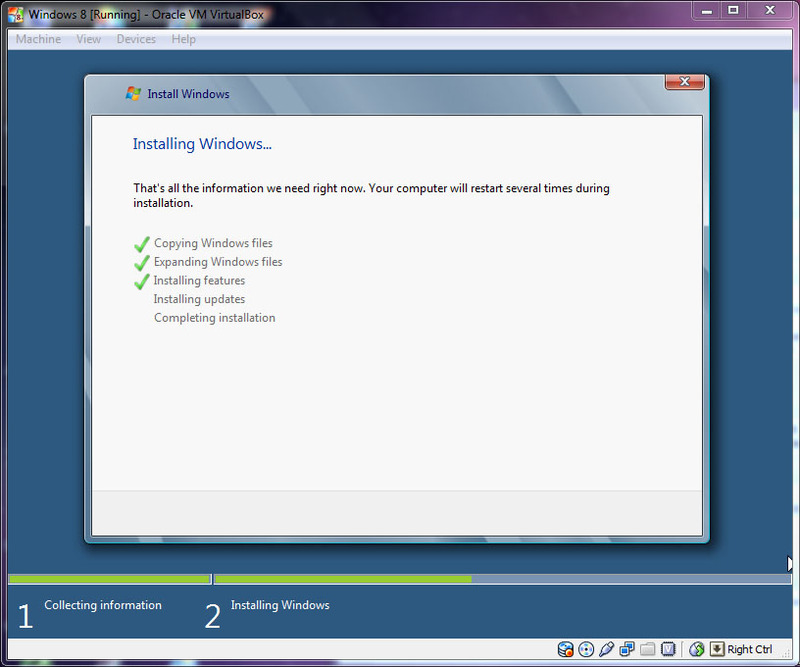 Click Start to install Windows 8. Select your language and other preferences then click Next to continue. Read and accept the license term. Then click Next. 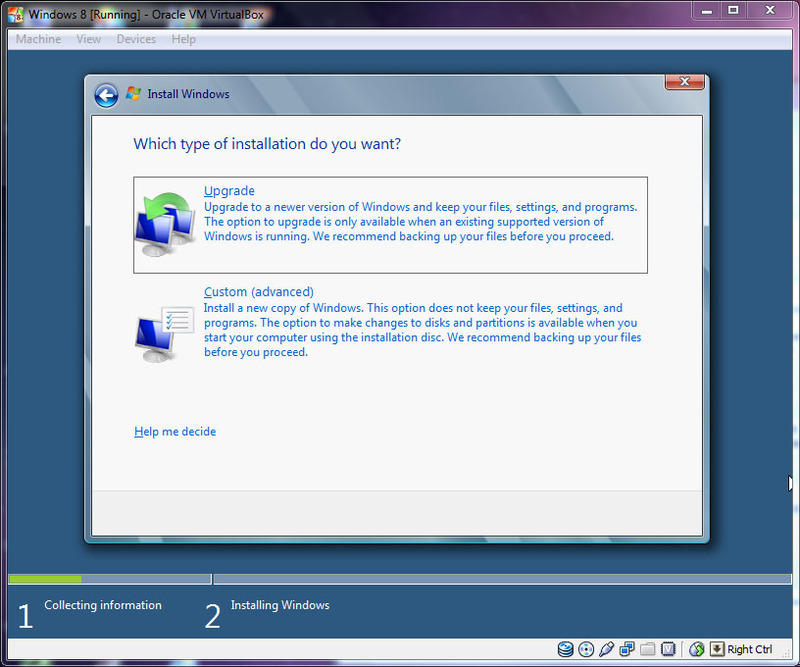 Choose Custom (advanced) to install new Windows 8. 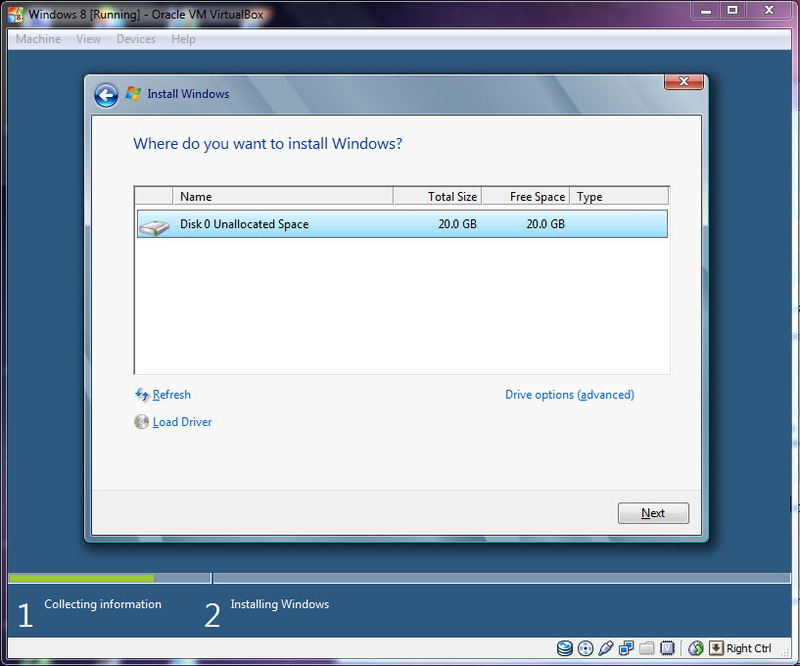 You will get the amount of free space created by VirtualBox Disk Image previously on VirtualBox. Click Next to start installing Windows 8. It will take some time to complete the installation. 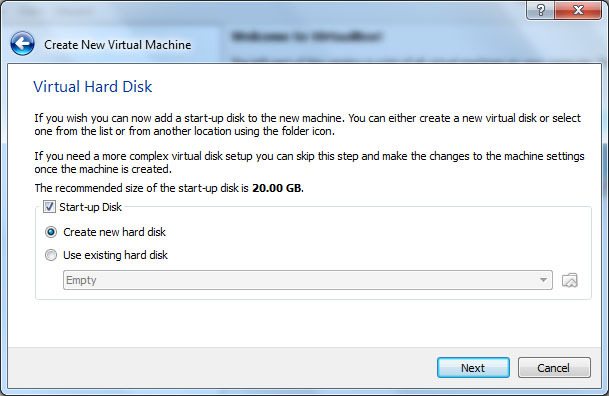 After installation completed, Windows 8 is already installed on your virtual hard disk. 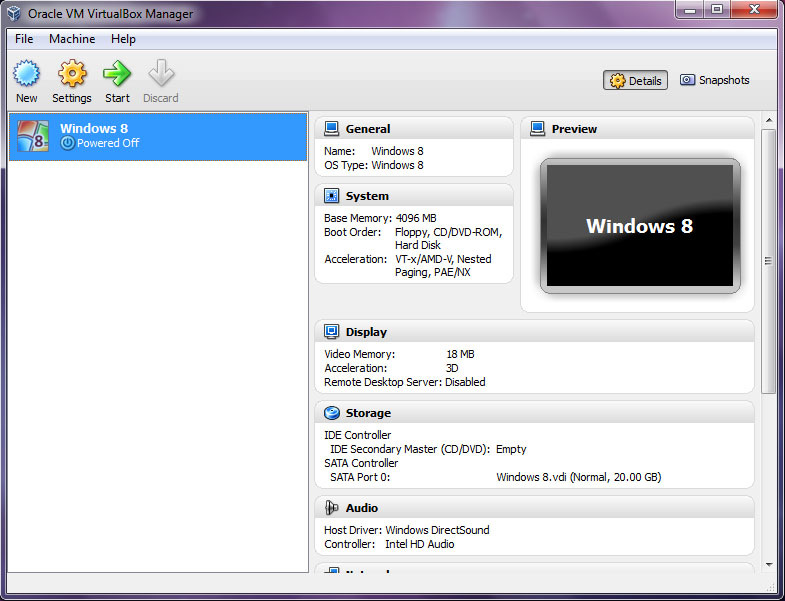 So you don't need to load Windows 8 ISO file anymore. 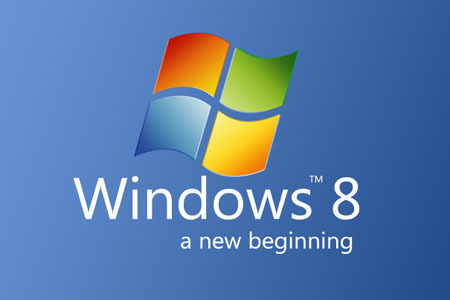 You may unmount the ISO file afterwards by going to Windows 8 virtual machine Settings, click Storage, and Remove Windows 8 ISO file from virtual drive. If you haven't unmount it, don't press any key to boot CD/DVD drive while VirtualBox try booting up the Windows 8 virtual machine. 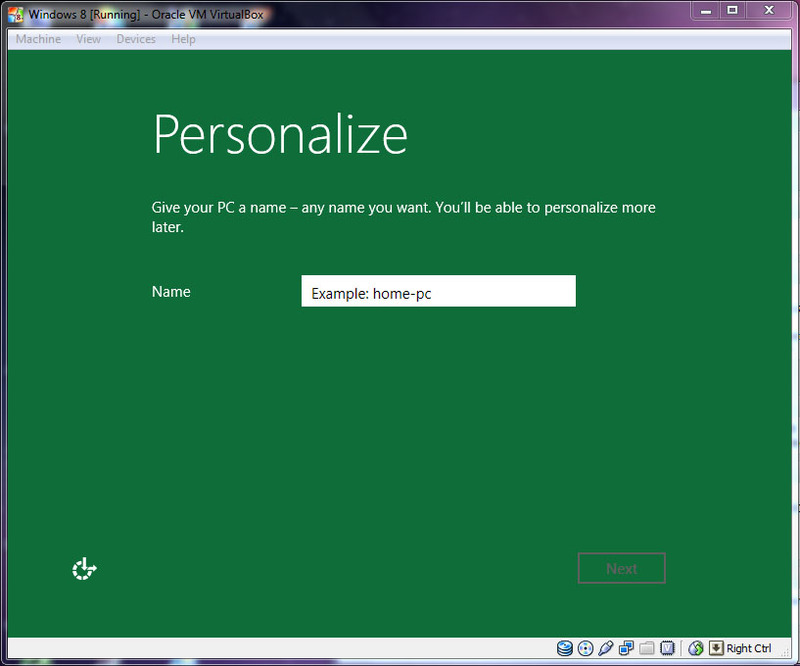 Personalize your Windows 8 virtual machine. Everytime you can boot up straight into Windows 8 virtual machine. Enjoy.